As part of its ongoing product range development, Cleveron is proud to announce the launch of its new CleverBox 2 indoor parcel terminal model. CleverBox 2 features unique drawer slots for small parcels and letters. It provides up to twice the capacity per column as previous models with the same footprint size. 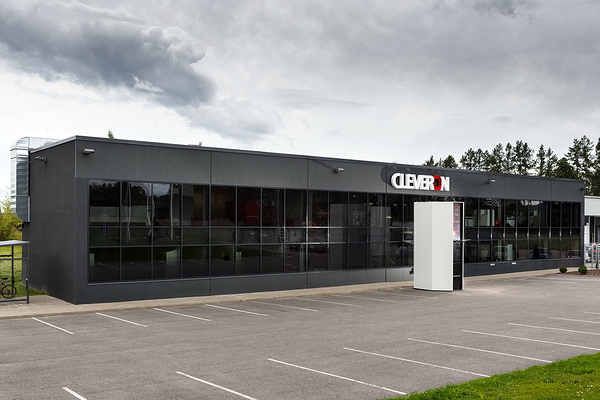 The expansion of the product range and increased sales have also seen the opening of Cleveron’s brand new assembly plant in Viljandi, Estonia. The company celebrated the official launch of the new plant on Tuesday 19th August 2014. Cleveron held a ceremony and reception hosted by famous Estonian magician Jürgen Veber. Also in attendance were VIP visitors Anne Sulling, the Estonian Foreign Trade Minister (who is responsible for foreign trade and entrepreneurship) and the Mayor of Viljandi, Ando Kiviberg. Reflecting on the launch of CleverBox 2, Arno Kütt, CEO of Cleveron commented. This is an exciting new product for us. It progresses from machines designed to carry larger packages to one which is equally able to cater for smaller parcels and letters. These are an important part of the growing delivery industry. It has been designed with the support of e-commerce firmly in mind, from parcel delivery and collection to returns. It also features a modular column design. By providing highly usable flexibility and configuration adjustments it meets the needs to the operator/user perfectly. CleverBox 2 has payment terminal option and label printer. It is the perfect technology partner for anyone in the C2C business sector. The new plant and increased scope for production is a clear indication of the growth in business we have generated. It also shows just how much the e-commerce parcel delivery sector has developed. We were delighted to enlist the services of Estonian illusionist Jürgen Veber to entertain guests at the opening ceremony in August. But of course there is no illusion to the excellent products and services we provide our customers! Both CleverBox 2 and the new Viljandi assembly plant are key parts of the company’s ongoing development. Cleveron’s products already handle over 53% of the Estonian distance selling parcel market. There are 4348 business clients registered with the SmartPOST service. In addition, around 40% of the population (over 500,000 people) have used it at least once. We are expanding abroad too. With significant inroads into the Finnish market, having supplied Posti Group Corporation (formerly Itella Corporation and Finnish Post) with 408 lockers from Helsinki to Rovaniemi, and the Russian market with 104 terminals. We also recently installed our first space-saving parcel terminal called PackRobot at Itella’s parcel terminal network in Estonia. With ergonomics firmly in mind, CleverBox 2 features a new modular column. It allows for many flexible modifications to be made. New design ensures it perfectly suits the operator’s and user’s needs. It also suites location requirements. To allow for full automation on site, CleverBox 2 has an optional self-service payment terminal and standard label printer. So users can process parcels and letters themselves. Afterwards deposit them in the appropriate compartment for collection and delivery. CleverBox 2 provides a clear 12” colour touch-screen computer for transactions. Also includes a camera for identifying users. The controls are situated 1,200mm from the floor, to help meet the needs of disabled people. Being perfectly positioned for customers using a wheelchair for example – along with a separate touch-pad for convenience. The drawer-based system, as opposed to a more traditional locker slot, is also designed to make the deposit and retrieval of items easier for all users. Also included in the unit are a bar code reader for the identification of parcels and a scanner for bar code or QR codes.